Originally intended to replace the rather utilitarian Mercedes-Benz G-Class, the first generation M-Class turned out to be much more luxurious and fashionable. Originally intended to replace the rather utilitarian Mercedes-Benz G-Class, the first generation M-Class turned out to be much more luxurious and fashionable. By the time the second generation car arrived in 2005 it was firmly cemented in the sight-lines of fashionable school-run mums and property developers alike, helped by that ubiquitous three-pointed star on the front grille. It was neatly designed with a spacious interior while decent on-road manners ensured that initial popularity remained until the market in luxury SUVs died in 2008. All versions of the M-Class came with four-wheel drive, five doors and usually five seats - some did have a rear-facing bench in the boot floor, but it’s only useful for short journeys or small children. 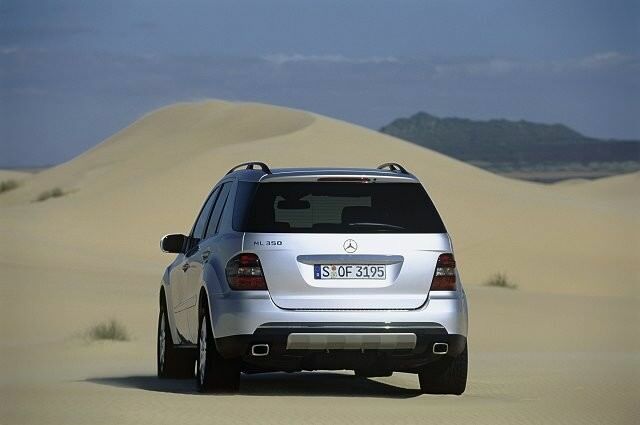 Regardless, the M-Class is still a spacious and well-appointed full-size off-roader, and though it lacked the outright ability of the Land Rover Discovery on the rough stuff, it had the equal measure of its BMW X5 and Audi Q7 rivals. There was also a wide range of engines, starting with the 3.5-litre V6 petrol unit, which had decent performance and a cultured six-cylinder sound, but proved costly at the pumps. Thankfully two diesel engines were offered; a 3.0-lite V6 that was economical and sufficiently powerful to make the M-Class a decent workhorse and a larger 4.0-litre V8 unit. The former came with two power outputs, initially badged 280 CDI and 320 CDI then 300 CDI and 350 CDI, while the latter changed from 420 CDI to 450 CDI after the 2009 facelift. The V8 may not have been as efficient as the six, but it did make the M-Class something of an ecologically sound hot-rod. By the time this second-generation M-Class was introduced the original’s five-speed manual gearbox was dropped and buyers could only specify a seven-speed automatic. This column changer was smooth and perfectly suited to the car’s qualities as a comfortable and capable, if not very exciting, luxury cruiser. Trim wise there were a few models to choose from, but most have been personalised from the massive range of options available when new, so it’s best to judge each car individually. Be aware that the M-Class was sold as a ‘Commercial’ variant though, which not only lost the rear seats, but also made do with an underpowered 2.0-litre diesel engine. The 4.0-litre V8 diesel engine is fun, but it’s the smaller 3.0-litre V6 diesel that makes the most sense. Try and find a post-2009 car, preferably the slightly more powerful ML 350 CDI and if you can find a Sport model even better, as the larger alloys and additional trim add a sense of visual purpose to the SUV. Dark exterior, and lighter leather interior colours work well, and if you occasionally need to carry extra occupants then the optional rear-facing bench seats are worth searching out. If you want to venture into the rough stuff then the Land Rover Discovery is a better choice of vehicle for your needs, but if like most SUV owners you’re planning on staying on the tarmac the Mercedes M-Class is a good choice. Its image is second to none, and on-road manners are impressive. Add to that the neat exterior design and great range of economical and punchy engines and it seems the M-Class can do no wrong.